Clean Freaks is an East Dallas based cleaning service specializing in residential cleaning solutions. We take care of all the tedious tasks so you don’t have to. Look forward to clean floors, an immaculate kitchen and a spotless bathroom! We bring our own cleaning supplies and tools so there’s one less thing for you to worry about. At Clean Freaks, pride ourselves in our ability to consistently surpass our clients’ expectations. We’re enthusiastic about what we do and it shows! Choose monthly, biweekly or weekly scheduling. We work to create individualized plans to meet the specific cleaning needs of our clients. 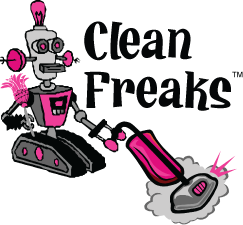 We’re freaks about cleaning your home! After realizing a true need in the East Dallas area for an affordable and reliable cleaning service, Mary Beach started Clean Freaks in 2005. Since it’s inception, Clean Freaks has served thousands of homes of various floor plans. We are dedicated to serving homes with our first-rate cleaning methods. Using a hands-on approach, the Clean Freaks staff goes through an intensive training program to learn our cleaning requirements and the specific needs of your home. The work of all Clean Freaks’ employees is guaranteed. Bonded and Insured, you and your home are in good hands with Clean Freaks. and other urban, East Dallas neighborhoods.